There has been a lot going on around Belay Enterprises this summer. The most exciting happening is the successful launch of New Beginnings Custom Woodworks, our custom cabinet employment and job training program for ex-offenders. I'm pleased to report that everything is up and running with sales far beyond our initial projections. Our director Dave Schuett is doing an awesome job. We're hoping to expand training opportunities for ex-offenders very soon as we secure additional warehouse space for the project. Indeed, our biggest challenge around Belay right now revolves around limited warehouse square footage. We plan to present an initial culinary program business plan to the Denver Jail in August. The Sheriff's Department is super enthusiastic about the potential of this project. The big challenge is figuring out the product line we will build our business around and determining its sustainability. Madison Chandler is finalizing her business plan for a coffee shop to employ homeless youth leaving the streets in the Dry Bones program and has started raising money. 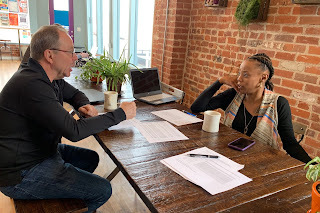 We are finishing a business plan for a coffee roasting business for ex-offenders in partnership with I Have a Bean Coffee in the Chicago area. In addition, we are exploring partnering to create a for-profit shed building and job training business to employ ex-offenders, assisting an individual developing a metal sign business that could employ homeless youth, working with another organization to produce structural framing for exporting, and assisting an expanding medical coding business to develop a program to hire ex-offenders from Belay. So, as you can see, everyone at Belay has been very busy. But one thing I am reminded of is that we can not do all of these projects on our own. It's not physically possible for Belay to run all of these businesses. We need to continue building a program that assists entrepreneurs to do what they do best while accomplishing our mission statement of creating businesses that employ individuals rebuilding lives. We must partner Christian business people with the above opportunities to provide technical assistance to maximize the natural momentum of the individual entrepreneur pursuing their business goals. And we must continue to seek out God's wisdom and guidance because "unless the Lord build the house, its builders labor in vain." Psalm 127:1 NIV. I look forward to an exciting end of the summer as we continue to work on these projects.